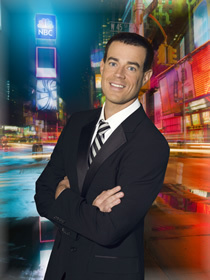 A late night variety show that’s led by former Total Request Live host Carson Daly. This New York-based series began on a black sound stage with just a few chairs and a table for the host and guests. During this time, a different little-known band was brought in to do the show’s music each week. Eventually more decor was added and the show relocated to Los Angeles. A more traditional late-night talk show set was added as was a house band (led by Joe Firstman), short comedy monologues, and occasional comedy skits. In later years, Daly and the show routinely began going out on location, to give audiences a perspective that’s different from the typical late-night fare. Highlights have included a motorcycle trip across the historic Route 66 and a visit to comedian Tom Green’s house. The series continues to highlight new performers, giving them an opportunity to be heard and seen by a nationwide audience. Acts like Maroon 5, The Killers, Katy Perry, Asher Roth, Ray LaMontagne and Gavin DeGraw have all made their network TV debuts on the program. What do you think? Do you like the Last Call with Carson Daly TV show? Do you think it should be ending or renewed for an 18th season? More about: Last Call with Carson Daly, Last Call with Carson Daly: canceled or renewed? I think the changes on the Carson Daly have made late night more interesting and familiar. Monologues have gotter so stiff and pretentious. I hope his show is not cancelled.